Moving abroad is a big and exciting step. Whatever the reason for your move, whether you’re emigrating, retiring or relocating through work, McCarthy’s are here to make the move trouble free! The key is careful planning and thorough organisation at every step of the way. From the moment you first make contact with us, our international moving consultants will ensure that you receive the very best advice on packing, transportation, insurance, any applicable customs regulations, storage and all our other services, to help you make the right decisions based on your needs. We’ll then work together with you to produce a detailed moving abroad schedule so that you know what’s happening and when. Our experienced overseas partners will ensure that customs clearance and delivery to your new home is handled efficiently and smoothly. Whether you have a few boxes to go to New York, a full home to Sydney or a car to Cape Town, McCarthy’s can organize everything for you! We are specialists in International removal and overseas shipping, with overseas partners, we provide a full range of relocation services for individuals, companies and agencies worldwide. We provide packing, overseas shipping and international removals for personal effects and household goods shipments from anywhere in the UK to most destinations worldwide. We can assist in anything from the smallest baggage shipment to your full house relocation and everything in between. 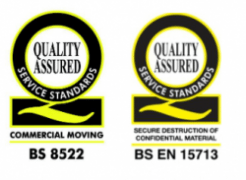 McCarthy’s and our partners are all members of the appropriate worldwide moving organisations (where applicable), including the British Association of Removers (BAR), Household Goods Forwarding association of America. (HHGFAA) and the relevant trade bodies for their countries. We do everything we can to ensure your move to another country is undertaken as safely and professionally as possible.